The HSE School Board has been discussing their video retention policy for months now. The previous school board overwhelmingly voted for videos to only be retained for 45 days before being removed. One board member indicated that for transparency the videos should be left online indefinitely. Because it wouldn’t be until later that videos would start to be posted, the old board decided the incoming board could review the policy and decide on changes. The new board is now in place and the video retention policy has been discussed a couple of times. If the policy is going to be changed, it is expected to happen next month. Why should the policy change? First, why not retain the video indefinitely? Other school districts and organizations leave their videos online. Storage is cheap, and storing them provides the ability to go back and find what was discussed. There have already been examples referenced by the new board to the interest in looking at old videos, something they can’t do because they don’t exist. Janet Chandler gave a brief presentation to the board. Parent, Cathy Goldman addressed the board, calling into question board reaction to social media postings. As you can see in the video, a lot was said that isn’t reflected in the minutes. More importantly, with a 45 day retention policy, an official video of this meeting would now be gone, expunged, lost in history. While a few board members might like to see it go, it could be argued that there were important points being made that would also be lost. This is just one example. As someone who has attended a lot of school board meetings, I could list other examples of where discussions in the board meetings were not reflected in the minutes. Such a list could be an entire article on its own. I won’t do that at this time. I believe there are currently three school board members that will vote for transparency and the posting of videos for the long term. I believe that there are two school board members that could vote against posting the minutes for the long term, just as they voted to keep the current policy no longer than 45 days. That leaves two board members that I would be hard-pressed to predict, which means a vote could go either way. THe first of these two, Brad Boyer, is an unknown to me on this topic. In the discussion from this last school board meeting, his contribution was about reviewing policies and not really about this specific policy. It was unclear if he had a point regarding the specific video policy, which left his potion questionable. The other unknown to me is Sylvia Shepler, who had sided with the old board on limiting the video to 45 days; however, the November 30th meeting she seemed to support the idea of leaving the video live “for at least four years.” From her past votes on topics, however, I won’t speculate on how Sylvia will vote. Of course, nobody’s vote is certain until it happens. In short, right now it is unclear how the vote for retaining the videos will go. I would strongly suggest people write the board members and push for them to support transparency and make a policy that leaves the videos live forever. Being able to go back and review discussions on topics that have happened within school board meetings is a valuable resource. Let’s hope that a majority of the board members see the value in leaving this information available. After all, if there is nothing to hide, then what’s the harm in leaving them public other than it making a number of people more accountable…. 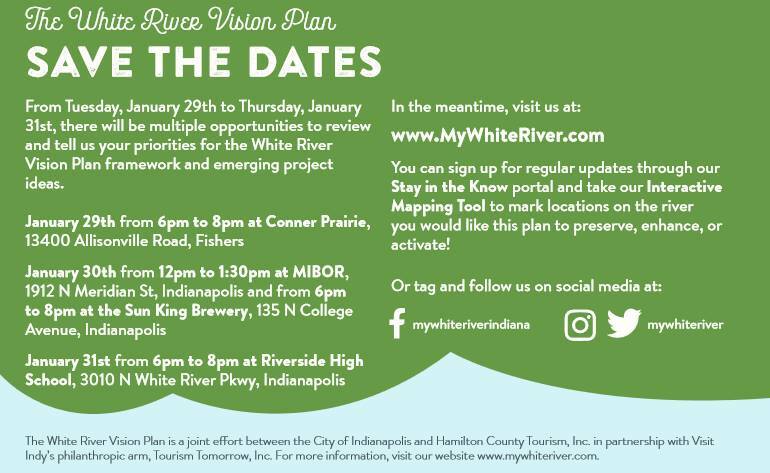 When it comes to the discussions of what is happening with the White River, there are lots of plans being created that stretch from the top of Hamilton County all the way to the bottom of Marion County. With Fishers being in the middle, you’d expect it to be included in the plans. Fishers is included in the plan, with a lot of changes proposed that include a boat launch, two pedestrian bridges that cross the river, walking trails, and a lot of planned activity ideas. 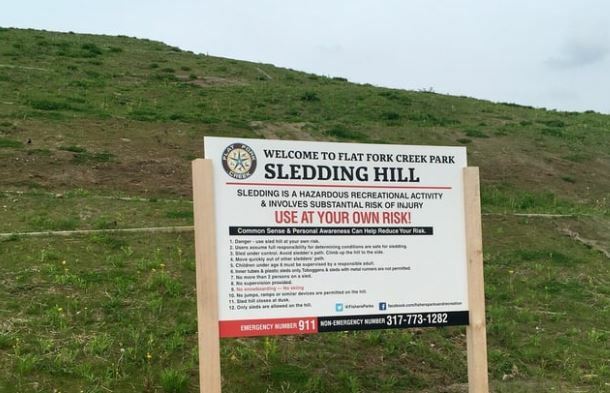 The issue, however, is that this would all be a part of Conner Prairie, and not likely public access. 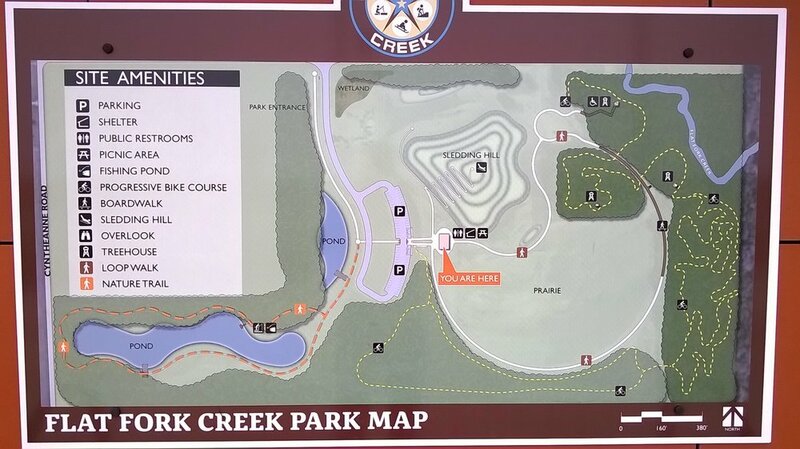 Conner Prairie has a map of their future plans that includes many features that tap into using the river. Once they have made their official public announcement, then I’ll be able to share a diagram showing many of their updates and the expected locations. 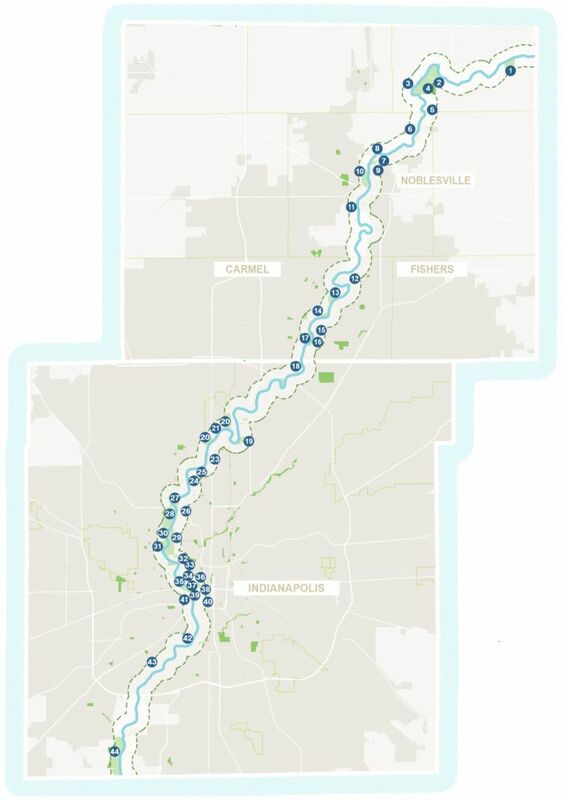 As a member of Conner Prairie, I find the bridge, trail, and other ideas to be great improvements; however, it would have been nice to see ideas for White River improvements applied throughout the other areas of Fishers. The Public level of access to the White River from Fishers is minimal, with primary access at 116th Street and South. Ironically, most of the Conner Prairie plans are in Carmel – the West side of the river. The Fishers City Council is focused on the rail trail and the new park on Geist, but it would be nice to see additional focus put on the White River and the opportunities it offers. Right now, the primary access from Fishers is a boat launch at 116th Street, Heritage Park, and behind the Riverside schools. 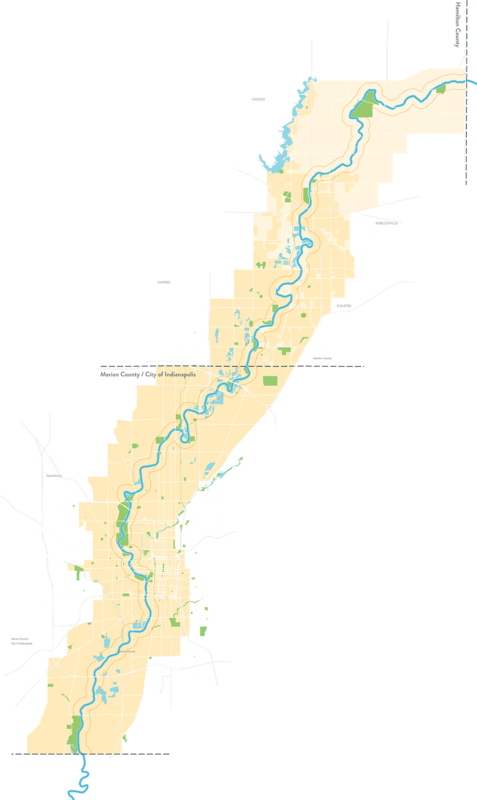 Adding access to the river at 146th Street would allow a person to canoe, float, or kayak down to 116th or even 96th Street. Additionally, adding easier access to the river at Heritage Park would make it easier to get in and out of the river. It would also open up tubing from 116th Street to Heritage Park. Outside of Fishers, there are a lot of popular destinations on the river. I mentioned many of the parks in a previous post. 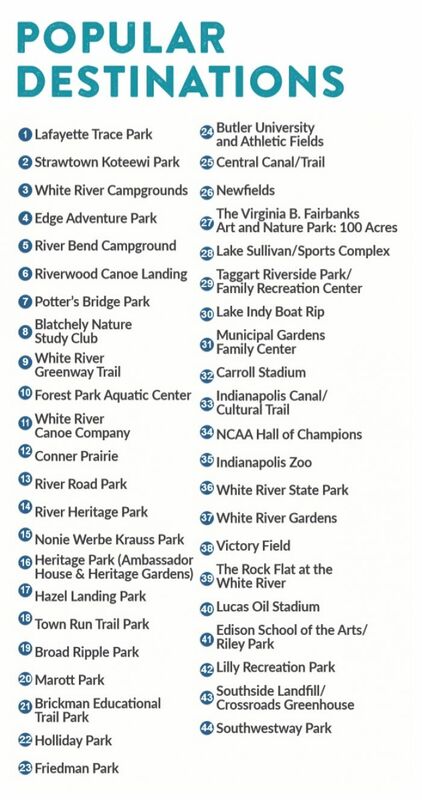 The following image from the White River planning committee list many of the popular destinations. It would be great to see more added that are located in Fishers! Hamilton Southeastern Schools has two high schools, Fishers High School (FHS) and HSE High School (HSE). While recent redistricting impacted many kids in kindergarten through eight grade, the district left the high schools alone – for the most part. The reality is, the high schools are not balanced. To offset this, Fishers has allowed parents to choose to send their kid to the high school outside of their area within the district. The result of this is that about 8 kids have chosen to go to HSE instead of FHS, and almost 200 have chosen to go to FHS instead of HSE. This doesn’t include the additional kids going to FHS for the IB program. 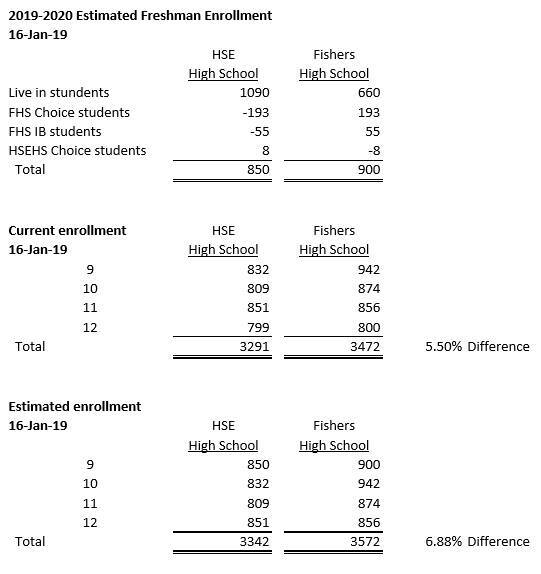 You an see that in the end, HSE is currently expecting 3342 students next year with FHS having almost 7% more at 3572. While Fishers High School is higher, the district expects growth to be on the HSE side of town, thus the lower number could change. The issue with high school choice, however, centers on transportation. The HSE district has offered transportation for many of the high school students even if they were not in the current district lines. This was not something guaranteed, so going forward transportation will not be offered. This has caused a number of people to complain. One of the biggest issues is that many people going to HSE have to drive by FHS to get there. Another issue centers on the neighborhoods near the dividing line. In those neighborhoods, there are a number of kids that have chosen to flip schools. This puts pressure on the remaining kids that are friends to do the same so they can stick together. For those families that can’t afford or have the means to drive their child to school, this adds undo pressure. Additionally, because neighborhoods are on the line, in some cases, busses from both high schools enter the neighborhood, yet kids can only use the one for the school they are allocated. Based on the comments made in the last HSE School Board meeting, redistricting at the high school level is not currently planned. The choice program, while not at the percentage the superintendent would like, is close enough to let things continue as they currently stand. The plan is to continue the experiment of choice for the next year or two. The school district is currently working on student numbers for next year now. These numbers need to be nailed down because it determines the number of classrooms and teachers needed. If there is a need to shift teachers or hire new teachers, that needs to be done sooner rather than later. As such, any changes to district school lines need to be finalized now. Question: Could buses be offered for those neighborhoods that have a busload of kids that are choosing to go to a different school? Answer: This would cause issues. There could be others that then want to switch schools who hadn’t done choice due to the lack of transportation. Additionally, other kids could say it is unfair to bus some kids but not all. Question: Could we extend the bussing done this year for another year? Answer: The reasoning for adding bussing this year no longer exists next year. Additionally, bussing was never guaranteed. Kids were allowed on busses if there was space. Answer: If a kid can afford to drive, they are likely to drive rather than bus to one school and then take another bus to school. Question: Why is Fishers High School more desired? Answer: Because kids at Riverside Junior High want to stick together as do those at some of the other High Schools. Additionally, Fishers High School is closer to where a lot of kids live.